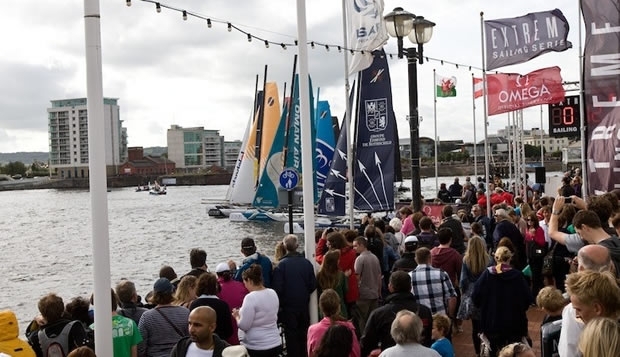 Crowds crammed into the best vantage points around Cardiff Bay today to witness Extreme 40 ‘stadium-style’ racing as Wales’ capital city proudly hosts the UK round of the Extreme Sailing Series global tour for the first time. A festival atmosphere was predominant around the Race Village neighbouring the annual Cardiff Harbour Festival. As festival-goers took a spin on the nearby helter skelter, the guest sailors were experiencing their own form of a helter skelter ride on board the Extreme 40s in the gusty, and up and down, winds on Cardiff Bay. Britain’s Leigh McMillan who helms The Wave, Muscat is aiming for his fourth straight win in 2012. If he does it, McMillan will match the four-straight wins of the Swiss team Alinghi in 2008 – Alinghi, then skippered by Ed Baird, went on to win the overall Extreme Sailing Series that year. Former Olympic Tornado sailor McMillan certainly has the bit between his teeth here in Cardiff - he and his team of Ed Smyth, Pete Greenhalgh, Bleddyn Mon and Omani Hashim Al Rashdi managed the difficult conditions to overhaul Roman Hagara’s Red Bull Sailing Team. There was delight for GAC Pindar, skippered by Andrew Walsh who is covering for four-time ISAF World Match Racing Champion Ian Williams. The British team may not have scored a single race win today but they were consistently finishing in the top half to claim third overall by the end of the penultimate day. The leaderboard is close, perhaps the closest this season. Only 12 points separate the top four boats, and just 1 point separates Alinghi in fifth place and Groupe Edmond de Rothschild and SAP Extreme Sailing Team which are on equal points, while 1 point divides Team Wales and ZouLou.